MANAGEMENT AND NEWSROOM Guild representatives met twice this week to continue collective bargaining talks. 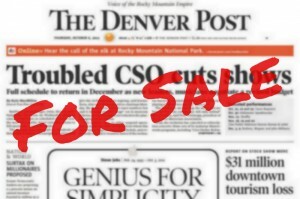 We picked up where we left off and discussed YourHub compensation and mentoring, as well as coordination of YourHub and Denver Post content, but did not arrive at any decisions. We agreed to revisit the topics in a later session. We will continue to explore this issue, including other options, at length in future bargaining sessions. Your feedback helps us negotiate for you, so feel free to sound off in the “Comments” section at the end of this post. Also, “follow” us to get new posts sent to your email (“Follow Us …” on the right side of the page). Our next bargaining session will be Feb. 15. Seniority, to me, is a no-brainer. It’s a deal-buster. I’m stunned that this is even being discussed. I could not support a contract that alters this issue. I completely agree. Productivity and performanceis completely arbitrary. And with no standard of review, how do they even think to pull that off? Same with ability to do the work. Completely arbitrary and set up to be capricious. Not a chance, just leaving it up to somebody who arbitrarily doesn’t like you for any reason. Might as well just disband the union if seniority rules don’t apply anymore. I mean, seriously, we all know what would happen. Older people out, young cheap people in. Experience still counts for something. It’s fine if you want to comment but don’t want to use your name — just enter a pseudonym in the “Name” field. If you have any questions, email me at hamm.kevin@gmail.com. No way I’d keep paying union dues if we just caved in on seniority. I agree with the preceding comments. Too arbitrary and sets up picking on people. The company already has a way to “rid” itself of longtime employees in buyout language. Will it cost them? You bet. While some other criteria than just seniority perhaps can be utilized in layoff decisions – seniority must still be at the top of the list. For the company to request that big a change to completely subjective decisions, i.e., ABILITY to learn new skills; ABILITY to do the remaining work (whatever that means -the extra workload?) is absolutely too carte blanche. Qualifications and productivity and performance – the question then becomes, as always, who’s making those decisions? It simply can’t be an ‘whatever criteria we want to use’ for layoffs’ proposition, period. Giving up any control would mean there’s no reason for union representation, would there? The buyout comment above is spot on. The whole question about layoffs also seems to smack of some psychological saber-rattling here, which is a tactic I and others resent. There should be a middle ground on this issue that takes into account the interests of all guild-covered employees. How does the status quo take into account more recent hires who joined the guild and pay dues? Or those who are working hard to embrace the new ways we can do journalism in the digital era (which includes staffers who are long-tenured, and others who are not)? Job performance – not just how long someone has been employed – should be part of the equation when it comes to layoffs, for the sake of the company and its employees. I don’t have a problem with any of these criteria per se IF what is meant by each of them is clearly defined. Although how you define “ability to do the remaining work” is bit of a mystery since at this moment I’m not sure any of us completely understand what the remaining work is. Also, in addition to defining clearly what these expectations consist of in each position, the company would have to keep us apprised of how we’re doing in these categories. I shudder at the words “performance review” but in the past it seems employees aren’t told they’re not cutting it until somebody has started a file on them and is trying to get them fired. They can’t wait til layoffs are imminent before telling someone they’re not meeting expectations. I would love to see the company agree to help subsidize bus passes. This is my pet issues. RTD has two programs, the Flex Pass and the Eco Pass. Currently, our company doesn’t provide either. Here is information on both: http://www.rtd-denver.com/Corporate_CommunityPasses.shtml The company can get tax write offs, we can help out the environment by not driving and it isn’t too much of a cost. I may be willing to listen to alternative ideas on seniority, but at this point my position is “no until persuaded” rather than “open to anything.” The long-tenured employees who are still here have survived and thrived because they are performing and growing. Senior employees with the highest pay — including merit pay — gave up a higher percentage of income in the last round. If there are penalties like that for long tenure, isn’t it reasonable to maintain some of the rewards? Performance evaluations seem like a good idea — and they have seemed like a good idea for the past few decades when the company has never, ever done them for newsroom employees. Do we suddenly trust them to create a performance review system from scratch with such a huge shiny object as seniority as the main thing at risk? What do buyout firms do? They fire people who get paid the most, regardless of performance, and retain or replace them with people whose primary virtue is that they get paid the least.